As summer approaches, we are preparing the 11th graders for internships by practicing a vital skill: job interviewing. Each candidate will soon be interviewed by their internship host before they are “hired” for the six-week work exploration experience, so this practice gives them self confidence and a preview of what may be asked at that stressful test of their job readiness. This year the “Mocks” were coordinated by Roseanna Neustaedter and George Roberts of our AOAT Advisory Board. These two dedicated professionals greeted and prepped the interviewers – a total of 11 individuals who committed to being at school for two hours on one of the three days of this annual event. Each student had a 10-minute one-on-one interview, then the whole group gathered at the end for a “debrief” to hear further suggestions and critiques from the interviewers. 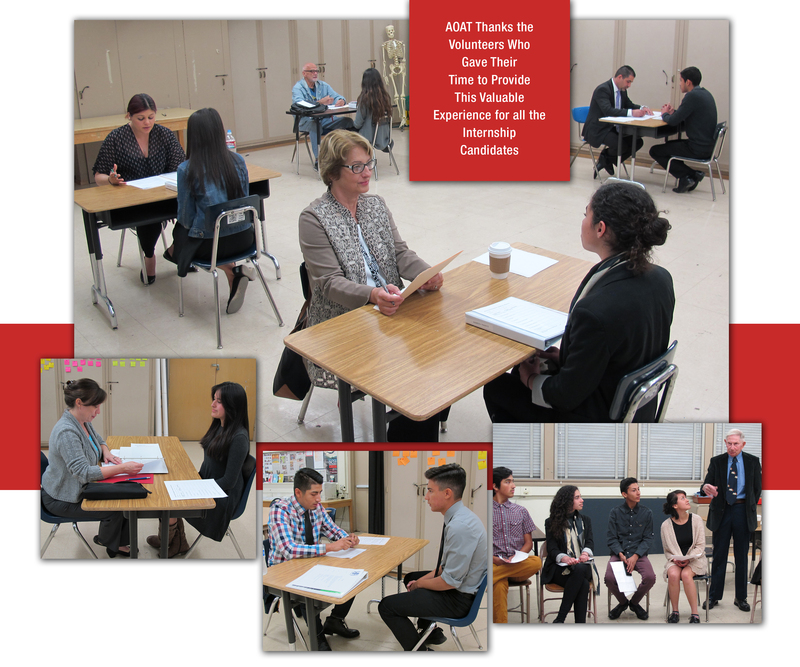 Our thanks go out for this support and participation of the community in helping AOAT students learn about job interviews and making their best first impression! 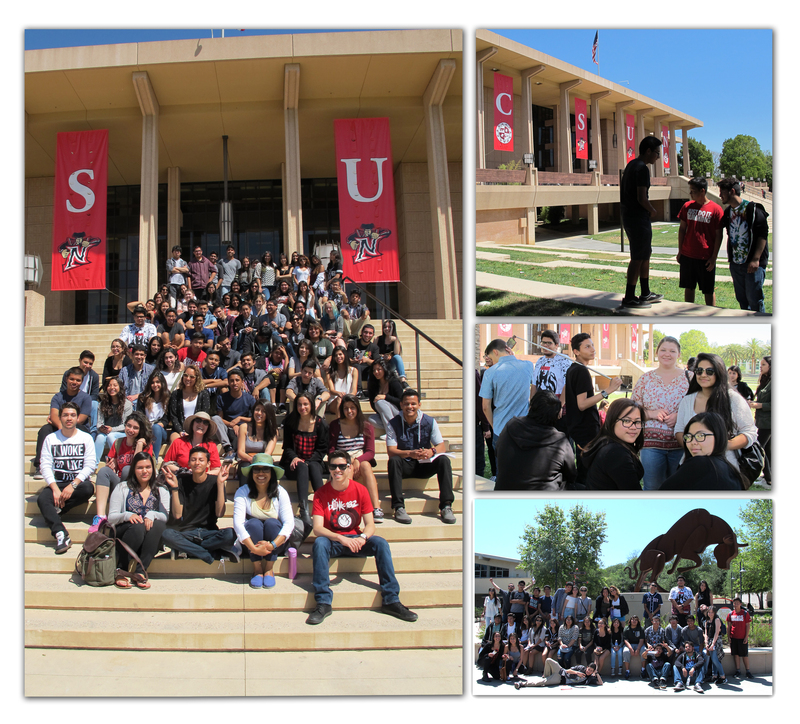 This year’s college trip combined visits to both CSUN and Pierce on the same day. We find the very visible contrast between this large university and small community college really brings home to high school students what lies ahead after graduation: choices! 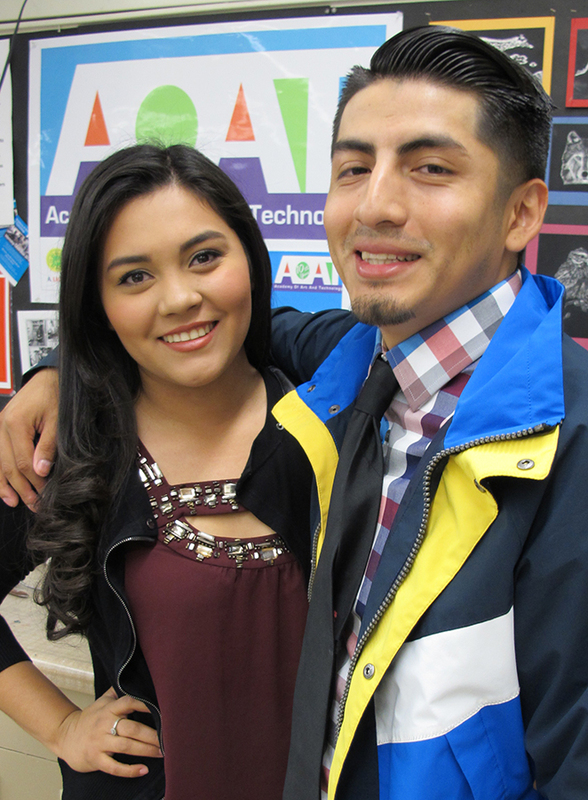 Many attend these two local schools, and some plan to pursue art studies that are the core of our academy program. Therefore we were excited that this year our Board member Larry Oviatt, an art professor at CSUN, organized a very special tour of their art department for us. We started our visit at the Art Gallery, which was showing a juried exhibit of current CSUN art students’ work. There was an amazing diversity of media represented that really showcased the variety of art courses available. Next we broke into smaller groups and went into 6 or 7 studio classes, including photography, 2-D design, 3-D design, and their campus graphics business, VisCom. All the instructors were happy to share what they were teaching, and answer questions. After this introduction to the art area, we met up with several AOAT alums who attend CSUN and they showed us around other parts of the large campus. For lunch we let everyone go their own direction, and met back up to bus over to Pierce. This much smaller school was almost deserted as there are few Friday classes, but again we were welcomed by AOAT alums who showed us around before everyone collapsed back on the bus to return to Cleveland. Everyone had a lot to think about, and maybe some better ideas about what college “looks like”! On April 7th Cleveland Charter hosted a very special event that brought Media Academy, AOAT, Be The Conscious Change Club, Taking Action Club, and the TIME Club together. Birgitta Olsson, one of the founding members of the International Youth Media Summit, presented “Self Images & Human Rights – Creative Force Collaborations”. This dynamic activist from Sweden is a leader in facilitating workshops around the world where teams of students from diverse cultures produce short films together to express their desires for a better world. Birgitta welcomed students from these diverse Cleveland High School groups to learn more and get involved. Next a panel of AOAT students presented about the Universal Declaration of Human Rights, then the other club representatives talked about projects for students to participate in to help improve the world. After these presentations, students broke up into smaller groups to discuss ten specific issues, from poverty and the environment to violence and discrimination, as well as youth empowerment, education and rights for the under represented. 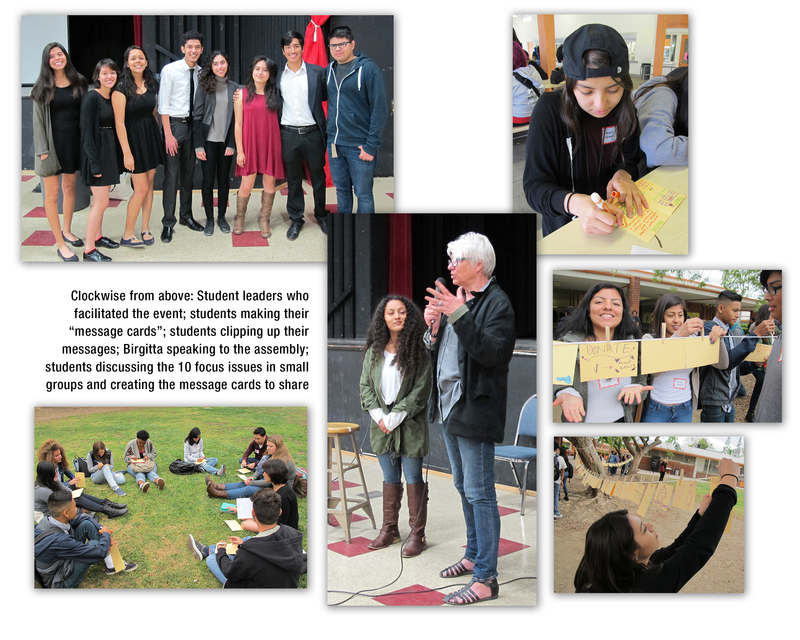 Student facilitators led these brainstorm sessions, then each student created a message card with images or words to express their ideas about how to implement change. Finally the participants took their cards to the quad and fastened them to a line to share with other students. The Cleveland “Global Summit” was organized by Evelyn Seubert of Media Academy, and Gabriela Rosillo and Laura Neustaedter of the Academy of Art and Technology. It was an inspiring occasion and students took away a new understanding of how they as individuals can effect change.